July 2014: Work Starts on Phase Two! 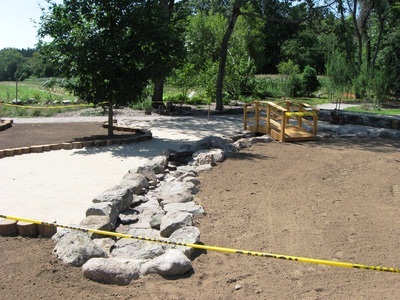 Work has started on Phase Two of the Playscape! 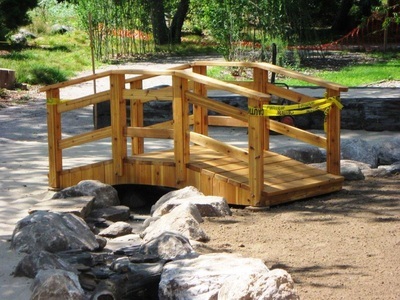 Phase Two provides for the completion of the accessible path started in Phase Two and the addition of a guide rope for the visually impaired, construction of two land forms (one with an embedded slide), and the installation of a water/sand play area and a dry stream bed with a bridge. The newly-built bridge over the dry streambed, with the inclusive raised sand area in the background. Cutting the outlines of the landforms to be built in the field.